Happy Monday everyone! 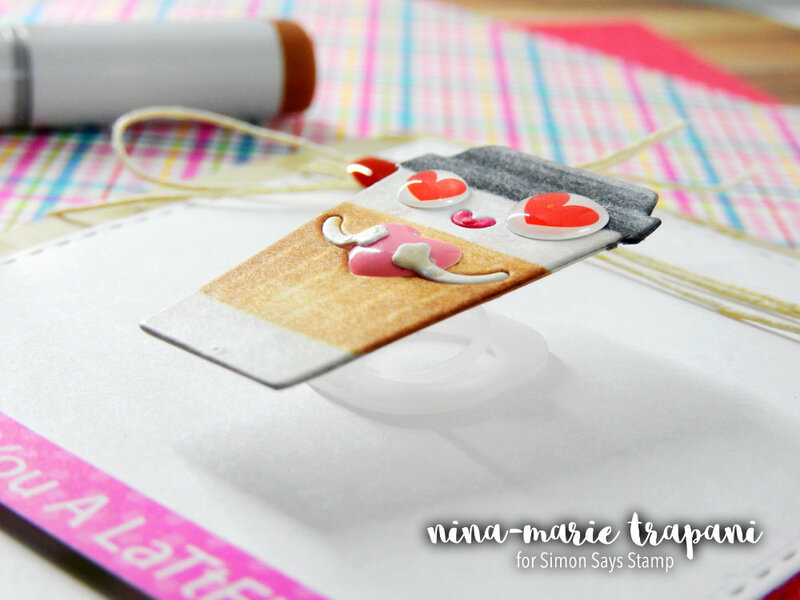 Today I have a card on the Simon Says Stamp blog for Studio Monday and I think you will love it A LATTE (sorry, couldn’t resist the pun)! 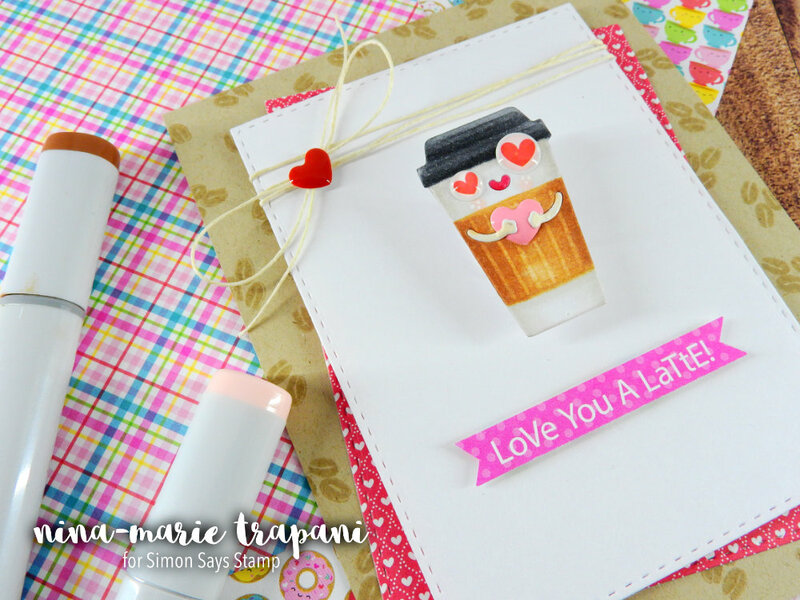 I’m featuring Doodlebug this week and what better to choose than their adorable Coffee Love collection? 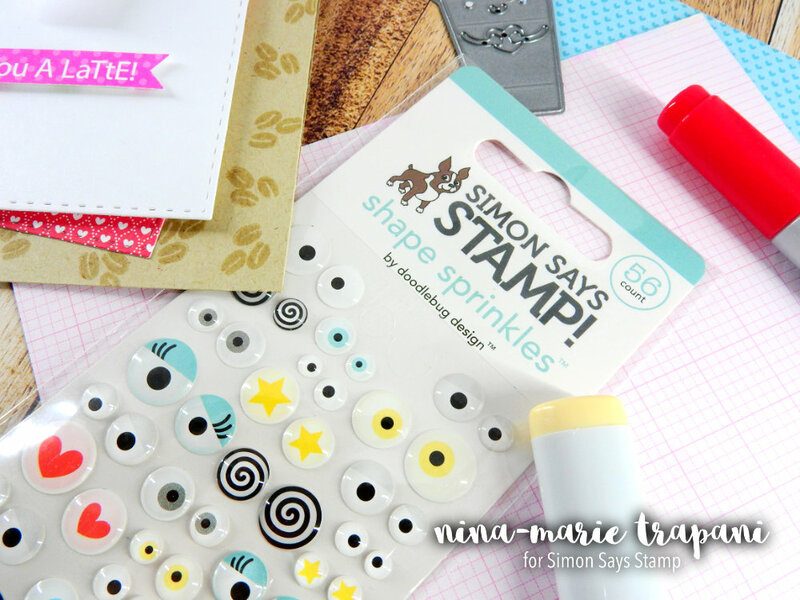 Another thing I am very excited about with today’s card is that I also used the Doodlebug and Simon Says Stamp collaboration All Eyes On You Shape Sprinkles! These Sprinkles are exclusive to Simon Says Stamp. Aren’t these just to die for??? I was thrilled to see these released last month! 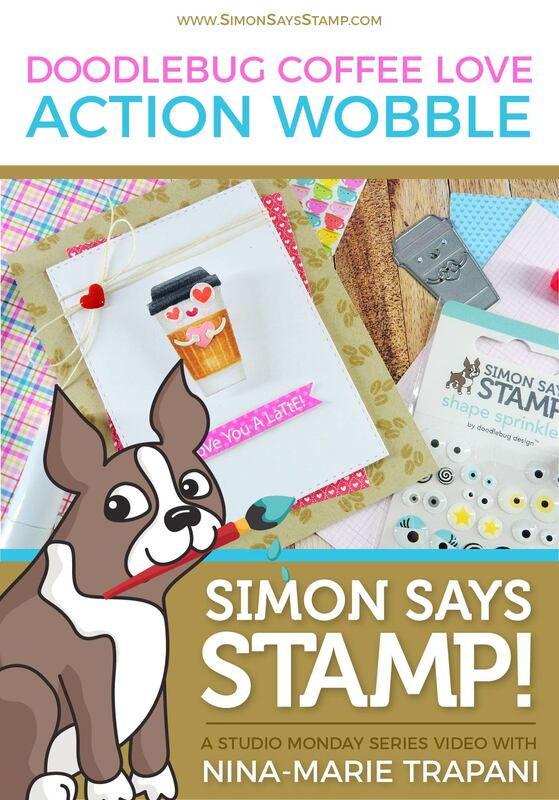 Have you ever made an action wobble card? 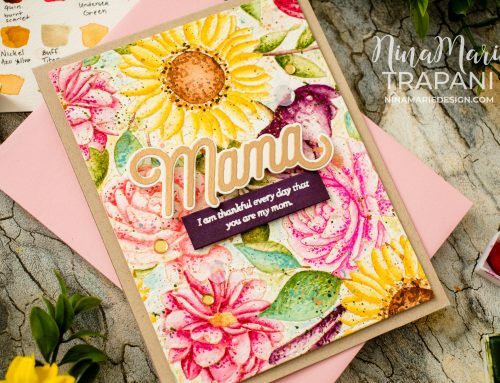 Action wobbles are a really clever way to add something totally unexpected to a card. 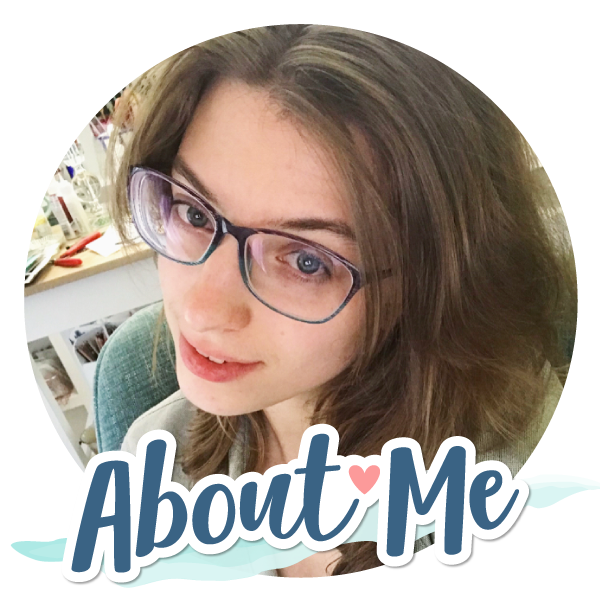 This is my first one and I love how it turned out… I had never made one before because up until recently, I had never had any small action wobbles, just large ones. The large ones work great, but are hard to fit behind certain stamped images and the large action wobbles were always too big for the stamped images I wanted to use them with. I die cut the coffee cup from white cardstock and colored it in with a few Copics; nothing fancy for shading, as I stuck to two markers per color. I did however use the Copic Colorless Blender to add texture and highlights. 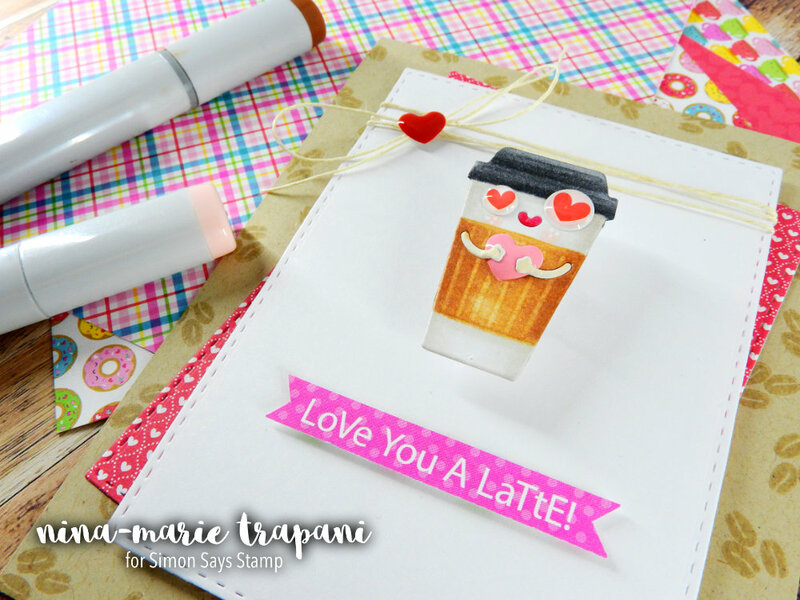 By using the Colorless Blender to create lines for the brown paper sleeve and highlights for the lid, it adds the perfect amount of interest to the cup. After coloring the cup, I added a pair of heart eyes from the All Eyes On You Sprinkles (its a love card, so there has to be heart eyes, right?). I also added a little pink heart Sprinkle in between the hands of the cup. 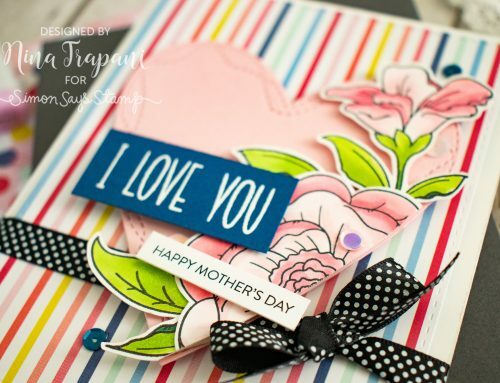 I thought the sentiment was totally perfect; I found it on one of the sentiment strip collage papers (from Doodlebug’s Cream and Sugar 6×6 paper pad). I trimmed it out with some scissors and cut little banner ends on either side. I popped that up with foam tape under the coffee cup. 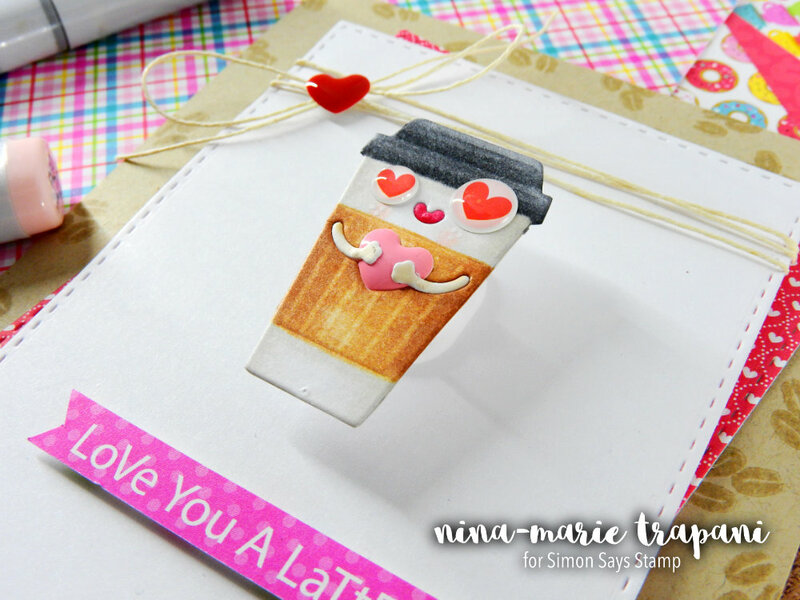 For the card base, I used Neenah Desert Storm cardstock, which I stamped coffee beans onto with the Newton Loves Coffee stamp set from Newton’s Nook. I layered some more pattern paper behind the panel my action wobble and sentiment were adhered to, and also tied on some hemp. For a final touch, I used another heart Sprinkle on the bow of the hemp. 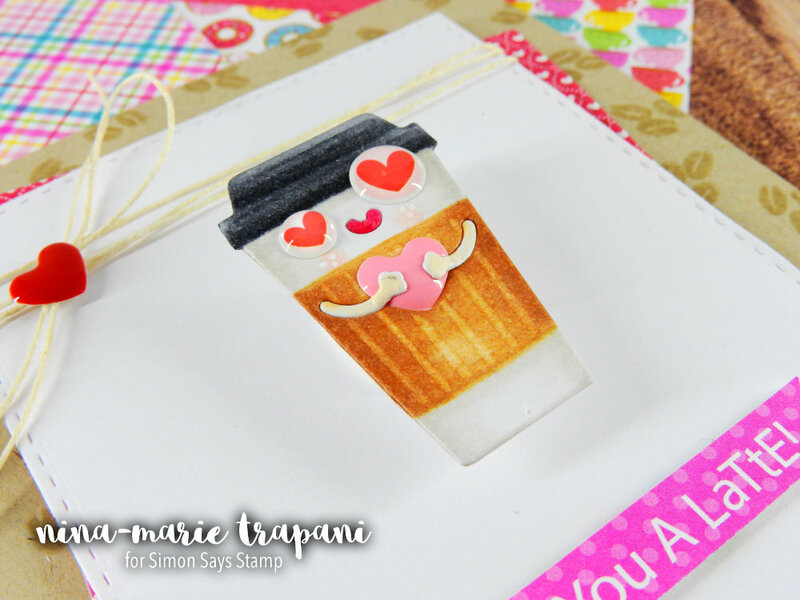 Isn’t it cute how those Sprinkles from Doodlebug and Simon Says Stamp really bring this coffee cup to life? 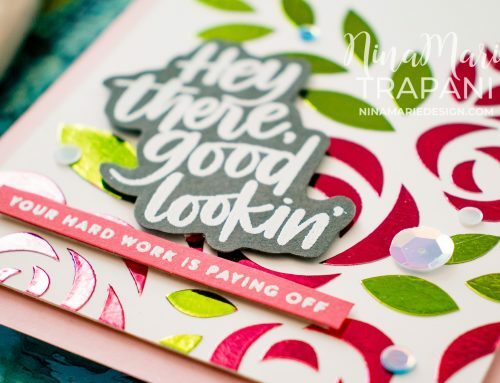 This card is FULL of love! I hope you love it as much I do, and that you will check out the video below to see how this all came together! Thanks for visiting me today! 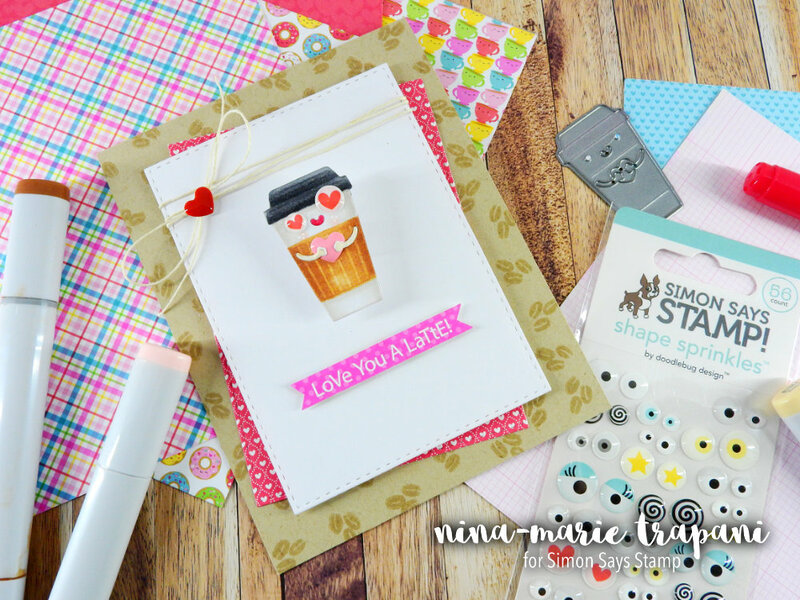 If you liked this video, you'll want to check out the video I created with the Doodlebug Coffee Love collection and the Simon Says Stamp February 2017 card kit!